← Green (and Purple) Thumbs Needed! Our Sunrise and the Here Comes the Sun Voyage. Ocean Kayak Malibu 2 XL in Sunrise colors. The northern spring. This is a time of beautiful new beginnings for all life in our region. With our fledgling venture, we HarborLAB volunteers renew our happy labors and commitment to creating good, positive gifts for our estuary, and for the communities through which it flows. 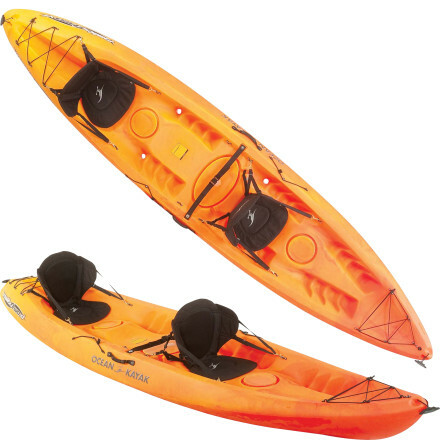 Emphasizing this spirit of continual rebirth, HarborLAB’s fleet of Ocean Kayak Malibu 2 XL and Jackson Kayak Riviera boats will be colored with the smooth red-to-yellow transition of a sunrise. Our fleet colors, which are great for safety, also speak to our commitment to an annual fundraising paddle for the American Foundation for Suicide Prevention, called the “Here Comes the Sun Voyage.” We’ll also have a shoreline fundraising party and ceremony. Date and destination details to come. This year we’ll raise awareness about depression, while in future years we’ll emphasize communities in particular need: LGTB and urban minority youth, Native Americans, and veterans chief among them. We’ll launch into the sunset and paddle through the night, returning with the sunrise. Our model is the AFSP tradition of “Out of the Darkness Walks.” Other third party events for the AFSP, on bikes and horses, carry the “Here Comes the Sun” name. We believe in this poignant metaphor of being there for each other through the darkness of depression and loss. We also know that participants will never forget how gorgeous our waterways are at night. But we happily emphasize the sun in naming our voyage, and honor the hopeful song. If you’d like to help produce the Here Comes the Sun Voyage as a volunteer (for the party or paddle) or sponsor please email baard@harborlab.org.